The most exciting show to, hit the circuit in years. Clubs, parties, fairs, festivals, major corporate events. Formerly kown as Parrotville, PARROTBEACH will have you singing, laughing, and dancing in the streets. Whether you’re a Parrothead or just a beach lover, bring the children bring the wife you’ll be in for the time of your life. They will bring the season with them. 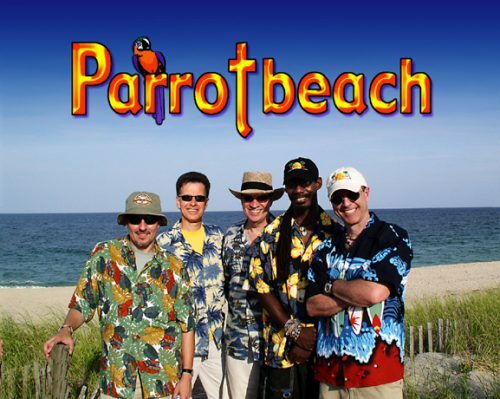 Doing the best of Jimmy Buffett along with your all time favorite island tunes, Parrotbeach will take you back to that unforgettable island vacation. Winter, Spring, Summer, or Fall, all you got to do is call, PARROTBEACH will make it happen! Parrotbeach is one of the few full time Buffett bands. They have been together for approximately 10 years, they met while playing in local club and original bands. The members of Parrotbeach hail from across our great nation, giving their sound a variation of musical influences. From Florida to Virginia, Hawaii to N.YC. Parrotbeach has the feel.